2015 NFL draft: A get-to-know-you guide to some of this year's most interesting prospects. It’s finally here. The 2015 NFL draft is upon us. On April 30, a group of extremely large, uncommonly athletic human beings will flock to the Auditorium Theatre in Chicago with the hope of landing a spot in football’s uppermost level. There will be plenty of pomp and circumstance—Roger Goodell will get thoroughly booed; ESPN will hone its green-room cameras on the player who slips far beyond his pre-draft projection; each pick will be graded and scrutinized—while the 32 NFL franchises go about the business of shaping and improving their futures. While there will lots of talk about potential and how various guys might fit into certain schemes, this space will address something else. Two hundred and fifty-six players are poised to enter the NFL, and the vast majority remain largely unknown. Consider this a get-to-know-you guide, broken down by position, for a handful of prospects not named Jameis Winston, Marcus Mariota or Amari Cooper. • Brett Hundley, UCLA: Entering the 2014 college football season, Hundley was regarded as the third-best quarterback in this year’s draft class, behind Winston and Mariota. Eight months later, not much has changed. He is projected roughly around the same spot, an intriguing dual-threat talent who is raw in several facets. But there is more to know about Hundley than that he threw for more than 3,000 yards in each season he was the starter. For example, he is a spokesman for the Epilepsy Foundation, as his older sister, Paris, was diagnosed with the condition at age 11. And he will hurl footballs at you for rule breaking, as he apparently fancies himself a tame, less-entertaining version of Terry Tate, Office Linebacker. And give Hundley this: He didn’t fall victim to the gross eye black misuse that plagued much of UCLA’s roster throughout the 2014 season. • Connor Halliday, Washington State: That Halliday still has a functioning right arm is seriously impressive. The latest disciple of Mike Leach’s throw-the-ball-every-damn-down philosophy, he attempted a combined 1,240 passes over his junior and senior seasons—and missed the final three games of the 2014 campaign after breaking his leg in the first quarter of a 44-17 loss to USC on Nov. 1. During one game last October, Halliday went 49-of-70 for 734 passing yards with six touchdowns and no interceptions. Washington State lost to Cal, 60-59. 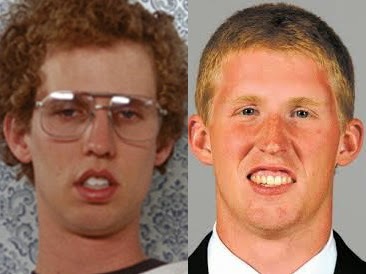 Also important: Halliday looks more than a little bit like Napoleon Dynamite. • Ameer Abdullah, Nebraska: During most of the pre-draft cycle, Abdullah has been highlighted for two reasons. One, he is extremely tiny at 5’9” and 205 pounds. And two, he is incredibly fast, something that allowed him to rack up 5,278 yards from scrimmage yards during his remarkable college career. Less talked about: He is the youngest of nine children. His first name means prince. He has an inspirational backstory—read this profile by ESPN’s Bonnie D. Ford—and was so good at hide-and-seek as a boy he simply couldn’t be found. He was so little they lost track of him once. The three youngest kids were playing hide-and-seek. Ameer curled up in the back of a long, narrow kitchen cabinet meant for pots and pans. Somehow, the other kids got distracted and abandoned the game, and suddenly, Ameer was missing. No one could imagine where he had gone, and his brother Kareem panicked, thinking he'd been kidnapped. Finally, Ameer emerged, crying and asking why no one had come to find him. That elusiveness also makes him a miracle worker on game days. Observe. • Josh Robinson, Mississippi State: For those who aren’t diehard college football fans, Mississippi State was one of the feel-good stories of last fall, a usual SEC bottom-feeder that opened the season 9-0 and rose to No. 1 in the AP Poll. And while quarterback Dak Prescott was the headliner, the 5’8”, 217-pound Robinson was the engine that made the offense go: He rushed for 1,203 yards with 11 touchdowns, including a 16-carry, 197-yard effort in a win at LSU on Sept. 20. “I think that’s why the women come to the game, to be honest,” Robinson added. Wherever Robinson ends up, keep this crucial information tucked away when your 2015 fantasy draft rolls around. • Breshad Perriman, UCF: One of the most tantalizing 2015 prospects given his rare blend of size, speed and athleticism, Perriman made 50 catches for 1,044 yards with nine touchdowns last year. The Lithonia, Ga., native, was a two-star recruit coming out of Arabia Mountain High, but blossomed into a star on campus—including when he caught a game-winning (and horribly defended) Hail Mary to stun East Carolina last December. He is also one of the more underappreciated Twitter follows in this year’s pool, as he frequently expresses the varying levels of #blessed he is. He invites his followers to indulge in the finer things in life. And he just got his teeth whitened, so you know he’s ready for the spotlight. • Kaelin Clay, Utah: Clay is known on a national scale for one moment: During a game against Oregon last November, he streaked down the middle of the field, corralled a deep pass and sprinted untouched to the end zone. Only he dropped the football at the one-yard line and an Oregon linebacker returned it 100 yards for a touchdown, making for an all-time blunder reminiscent of the infamous fumble by DeSean Jackson—who, as it happens, is a fellow graduate of Clay’s high school. But Clay, who is being projected as a mid-round pick, should be known as much for his response to that play as for the play itself. He has been nothing but open about the gaffe, even referencing it in a joke when Oregon’s Byron Marshall committed a similar mistake during the national title game. He also rejoiced when his reign atop ESPN’s “Not Top 10” finally ended. Oh, and Clay is supremely confident. He struck the Heisman Trophy pose after returning a punt for a score in a win at Michigan and recently said this. • Maxx Williams, Minnesota: Williams is a freakish athlete at the tight end position who can do stuff like this and this. That’s a product of his lineage: His father, Brian, is a former NFL offensive lineman and his mother, Rochele, was a standout women’s volleyball player for Minnesota. I hope the Cleveland Browns draft him No. 12 overall and attempt to use him primarily as a punter. Please make this happen. Please. Please. Please. • Nick O’Leary, Florida State: He is the grandson of Jack Nicklaus. He boasts a style teammates describe as “nasty.” And he was involved in a motorcycle accident in which his bike was shattered into approximately 1,327 pieces and in which he promptly GOT UP AND WALKED AWAY (with only minor injuries). • Brandon Scherff, Iowa: Scherff is the real-life version of The Incredible Hulk. This is no state secret by now. There have been multiple features written about the likely top-10 selection, which include nuggets like he earned the nickname “Paul Bunyan” working on a Christmas tree farm and could lob a shot-put 65 feet in high school. But it’s one thing to read about his strength. It’s another to watch it action. Below is a video, recorded last July, of Scherff hang-cleaning 443 pounds. Dear lord. • Watts Dantzler, Georgia: Dantzler is a 6’7”, 302-pound lineman from Dalton, Ga., who helped pave the way for star tailbacks Todd Gurley, Keith Marshall and Nick Chubb during his time with the Bulldogs. But the reason you should know of him is because, without question, he has the best social media presence of any player who could potentially be drafted over the next few days. Fare thee well, Watts. Among college football fans, you shall never be forgotten. • Michael Bennett, Ohio State: Bennett is an unmistakable presence on the football field, a mammoth defensive tackle who anchored Ohio State’s national title-winning defense and is expected to go in the second or third round of the draft. He is also an outsized presence away from the gridiron, and has been from the time he earned a first-degree black belt in taekwondo at age 8 to the times he regularly dominated his roommates and girlfriend during their weekly games of Monopoly. ​At one point, Bennett’s girlfriend, Carolina, landed on his property and was short on cash. After assuring Carolina he’d let her off for a lesser amount, Bennett thought about it and then turned to a roommate, Brandon Beam. I’m not going to let her off, he told his friend, which is how Michael Bennett bankrupted his girlfriend out of Monopoly Monday. Plus, Bennett gave President Barack Obama bunny ears in a photo taken during Ohio State’s trip to the White House. This qualifies him as a true American hero. • Brock Hekking, Nevada: Is Hekking likely to get drafted this weekend? That remains uncertain at this point. But he allegedly rode around Nevada’s campus in this glorious camouflage golf cart. And that hair. Oh, that hair. • Dante Fowler Jr., Florida: One of the most dominant defensive players in the SEC, Fowler toiled away for mediocre teams during the past two seasons at Florida. That hasn’t stopped him from attracting tons of attention. The defensive end and outside linebacker hybrid (he is expected to be a linebacker at the next level) is projected as a top-five pick reputed as much for his boisterous personality as his absurd athleticism. “I’m like the Shaq of football,” he recently told USA Today. Fowler harbors dreams of becoming a fashion designer and plans to wear a white Versace suit to the draft. He started carrying around a Chucky doll last year to honor injured Gators teammate Dominique Easley. And his production is insane: 15 tackles for loss, including 8 ½ sacks, in 2014. You want this guy on your team. • Kwon Alexander, LSU: Speaking of prospects with style, enter Alexander, who committed to the Tigers in 2012 rocking purple suspenders and a bow tie. And somehow pulled off this floral-patterned jacket. Alexander, who is undersized for his position, also possesses outstanding speed: He ran a 4.55 40 at the combine, the second-best time of any linebacker. • Kevin Johnson, Wake Forest: One of the most overlooked possible first-rounders in the 2015 pool, Johnson has steadily risen up draft boards over the past few months. Yet that’s not as impressive as his unlikely rise to become a Division I star. Johnson was only 5' and 96 pounds as a high school freshman, according to a Washington Post story—measurements that more closely resemble Shakira’s than the player whom Johnson models his game after, Joe Haden. He has come a long way since then. His athleticism has, too. If his Twitter feed is any indication, the team officials who pick him should do flips in the War Room. • Senquez Golson, Ole Miss: While Washington linebacker Shaq Thompson gets the majority of attention among 2015 prospects for his two-sport prowess, Golson may have him beat. The Boston Red Sox selected the Pascagoula, Miss., native in the eighth round (262nd overall) of the 2011 MLB draft, but he passed on a $1.4 million contract to go to college in Oxford. That resulted in a huge ’14 campaign: Golson reeled in 10 interceptions, tying a school record. He is best known for his game-clinching pick against Alabama on Oct. 4—he later admitted to preparing for the Crimson Tide, at the expense of other opponents, for the better part of a month—but should also receive recognition for his crowd-pleasing dance moves, which he should surely bust out on draft day.